Riverine rabbit, critically endangered creature of the Karoo. The more pet names an animal has, the more loved it is. The riverine rabbit has more than its fair share: doekvoet, pondhaas, Bushman’s hare, Deelfontein hare, boshaas and vlei haas. And for science – Bunolagus monticularis. This most beloved creature is the poster bunny for conservation. Experts say there may be no more than a few hundred left. 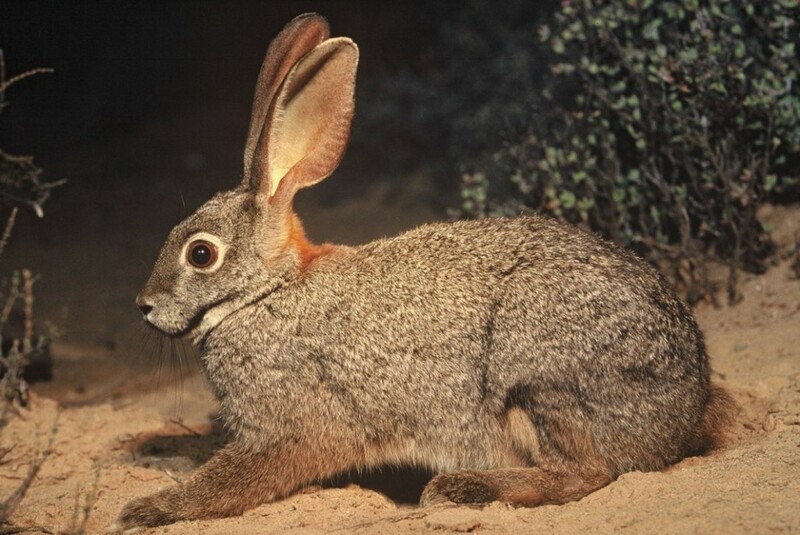 Not only is the riverine rabbit critically endangered, it is found only in the Karoo. In the few photos taken of it, a white ring around the eye and a distinctive black stripe stretching from mouth to cheek give it the air of a startled moustachioed matinee idol trapped in the spotlights wearing fluffy slippers. Beloved, cute and rare, this rabbit has faced a constellation of challenges ever since agriculture started in the Karoo. Its fate is tied to that of seasonal river banks. It uses the rich silty soils for burrowing. This is also where its favourite foods of inkbush, buchu and other plants remain green for longer. They are also usually the first areas to be degraded by grazing and crops. As the rich topsoil erodes away, so does its natural home. Hunters, dogs, traps and general habitat destruction have pushed it to the brink. And then there’s the third factor: riverine rabbits don’t breed like rabbits. Since the species was discovered by a British trooper in 1901 at Deelfontein near Richmond, it has dipped in and out of human awareness, vanishing for decades at a time. When the curator of the Kaffrarian Museum in King William’s Town offered a pound a specimen in the 1930s, they were refound, near Calvinia (and dubbed the pondhaas). The Endangered Wildlife Trust has set up the Drylands Conservation Programme in nearby Loxton which coordinates efforts to save this charming rabbit. The programme works closely with farmers, helping to revegetate the dry banks so loved by this nocturnal, solitary bunny. Its mere presence on a farm has become prestigious, the indicator of a healthy river ecosystem. With so few riverine rabbits, years can pass before fieldworkers actually catch a glimpse of one, so it’s difficult to build up a picture of their habits. Camera traps have changed all that. 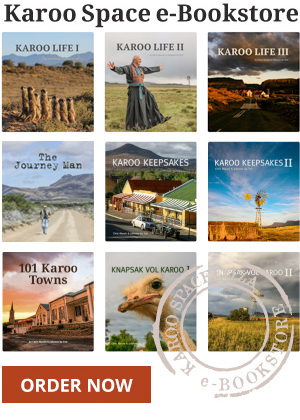 They are activated by motion and capture candid images of anything moving along Karoo riverbeds. Some camera traps were placed at the privately-owned Sanbona Wildlife Reserve, only three hours’ drive from Cape Town. To everyone’s surprise, this 54 000 hectare reserve is home to several riverine rabbits. The riverine rabbit’s range has been found to stretch far further south, in recent years, than its ‘traditional’ range around Williston, Fraserburg, Carnarvon, Victoria West and Loxton. Isolated populations have been detected around Montagu, Klaarstroom, Touwsrivier, Barrydale and Prince Albert. The latest news is that a small population of them has also been found in Anysberg Nature Reserve near Laingsburg, which has caused great celebrations among Karoo conservationists. For more information, call 011 372 3600/1/2/3 or email ewt@ewt.org.za. Wonderlik !!!! Ek leer graag meer van die soort ding. Ons kennis is waarlik te beperk. I live outside Montagu . We have two Riverine Rabbits who appear early morning to drink from the water containers we leave for other wild animals eg Meerkatte , Porcupines ,Steenbokkies , Mountain Tortoises etc. With the drought , our “water holes ” have become a gathering place for wild life . Hi, I was wondering who took that picture? I do art about loss and would like permission from the photographer to use a likeness of it. Ons het een in Camdeboo Nationale Park gesien vandag. Baie opwindend gewees!